It was nice of this fellow to stop for awhile right in the middle of the trail so I could get its picture. Apparently it was crossing the trail and got spooked enough from seeing us to freeze, but not spooked enough to speed off. 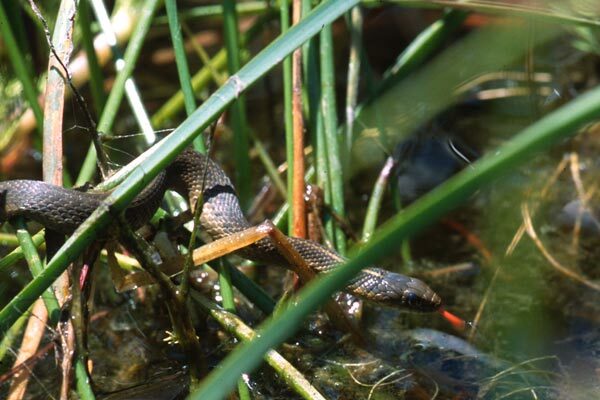 This very young snake was under a rock near a pond full of Sierran Treefrog tadpoles and froglets. This was one fat and happy little snakelet. 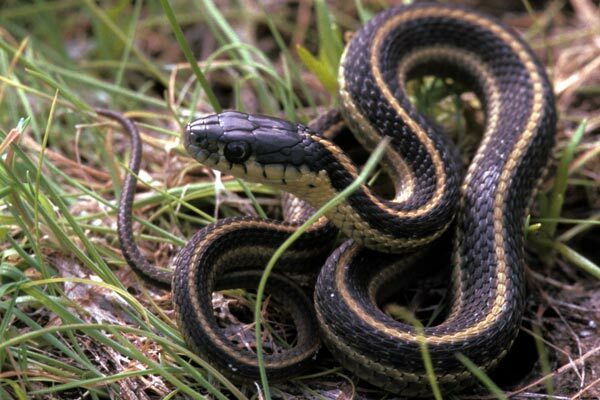 It's not simple telling the various gartersnakes apart, and often you'll find two or even three different species living in the same area, specializing in different prey. 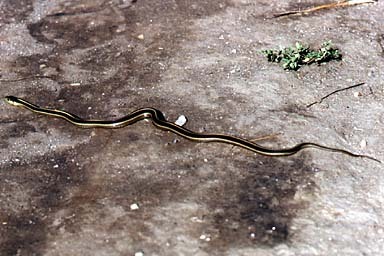 I originally identified this as a Coast gartersnake, but correspondents Joshua Puhn and Jim Tracy were kind enough to set me straight. 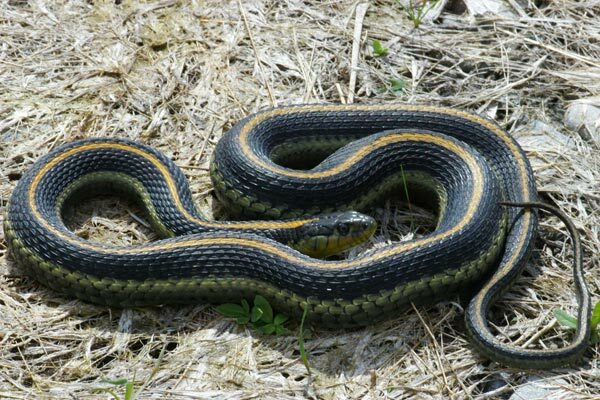 This is a particularly large and, especially, fat Santa Cruz gartersnake. There were a lot of Sierran Treefrogs hopping about in the area, which could explain the numerous lumps in this happy snake's body. 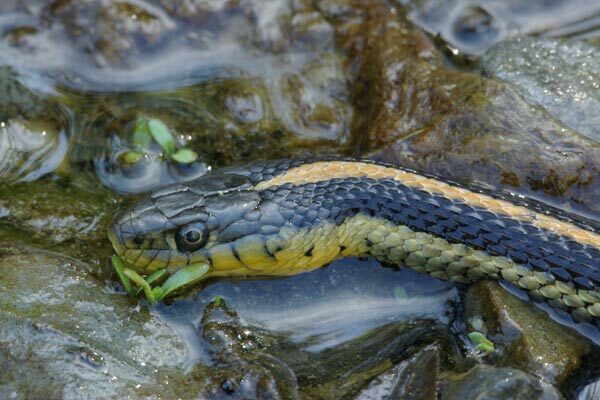 This young gartersnake was sharing this corner of the lake with a bunch of gartersnakes of a different species. 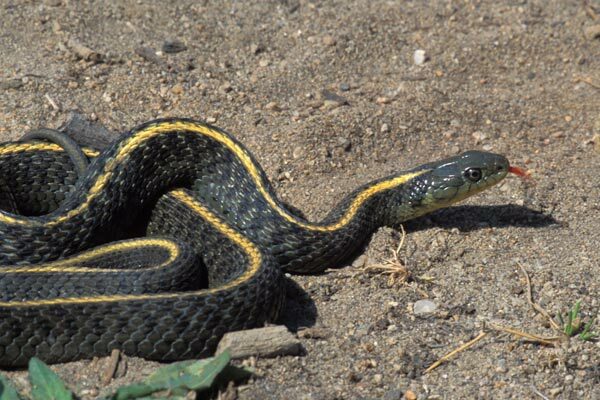 I keep seeing two species of gartersnake in the same place, so I guess it's not as unusual as I would have thought. 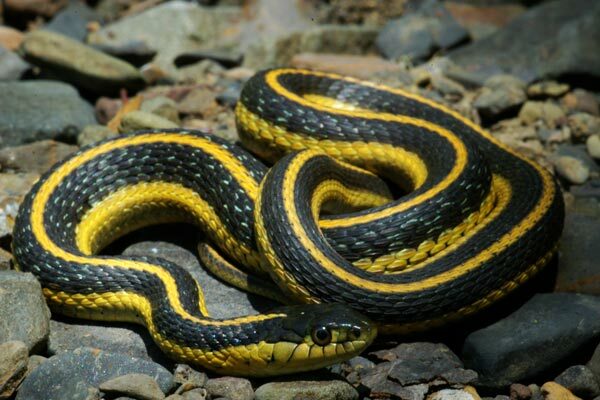 One of the distinguishing features of Aquatic Gartersnakes in this part of their range is that they tend to have a very deep yellow stripe, which this one demonstrates nicely. We were intending to visit Andrew Molera State Park in the Big Sur area, but were saddened to discover that at some point they had changed their policy and no longer allowed dogs. So in search of a dog-friendly hike we drove inland and northward on the Old Coast Road that hits Pacific Coast Highway near Andrew Molera State Park. 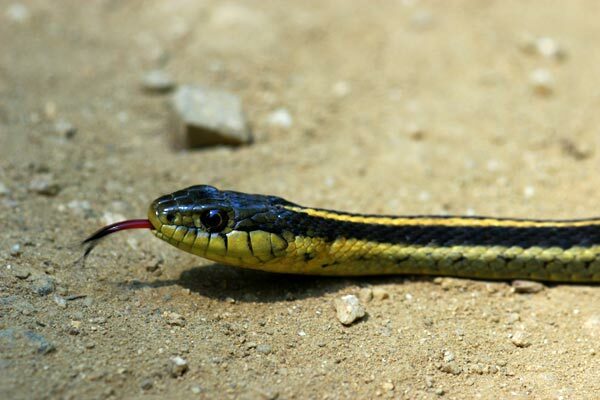 We never did find any dog-friendly hiking in that area, but we did find this one gartersnake basking on the road. We ended up heading to one of our favorite dog-friendly spots, Garland Ranch, where our dogs had a close encounter with a rattlesnake (with a happy ending). My friend Fred Harer went out for a herp-spotting hike on this winter day, hoping to discover some herps enjoying the unseasonably warm temperature. 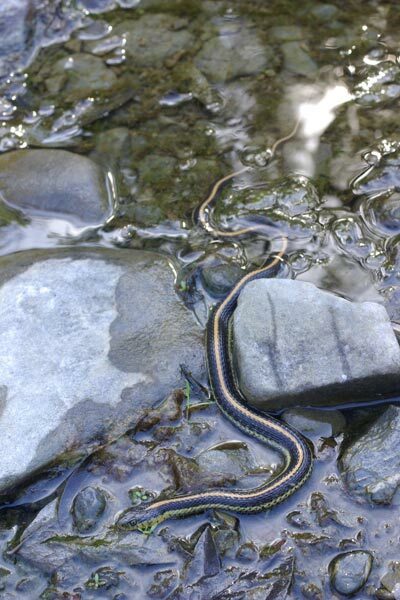 Fred found this gartersnake resting fatly in a shallow creek, probably daydreaming of the treefrogs or newts it had recently devoured. 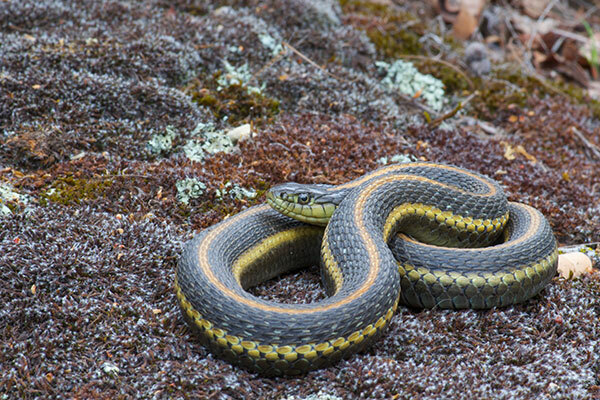 This handsome adult gartersnake was posed by the group of herpers I was with. It looks like it would rather be somewhere else, and soon enough it slithered off to fulfill that dream.